Download "RULES OF THE ROAD BY LWTL Staff Writer"
1 RULES OF THE ROAD BY LWTL Staff Writer Publisher s Note This is the First of a Three Part Series on Pedestrian and Bicycle Safety. This First Part is made available to all readers. The final two parts will be available only to subscribers of Living with the Law. Subscribe today. Introduction Washington, D.C has much to distinguish it as a world-class city. One such distinction being the number one most traffic congested city in the U.S., according to the Texas A&M Transportation Institute 2012 Annual Urban Mobility Report. Traffic jams, crowded metro rides, and high gas prices, have increased bike riding in the District by 255.6% between 2000 and 2012 (Bicycle Commuting Data League of American Bicyclists). Considered a Bicycle Friendly City, the District now ranks second in biking and walking (Alliance for Biking & Walking). Perhaps not surprisingly, the combination of increased vehicular, bicyclists and pedestrian traffic congestion in DC streets has resulted in an increase in total collisions in the District from 17, 955 in 2010 to 18, 428 in 2012, nearly 72% of these resulting in property damage and 29% in bodily harm. Bicycle crashes also showed a continuous increase almost doubling to 538 in 2012 from Crashes involving pedestrians also increased from 777 in 2010 to 919 in (DDOT Traffic Safety Crash Reports) These alarming statistics provide the backdrop for Living with the Law's three part series which we hope will help to educate drivers, cyclists and pedestrians about their rights and responsibilities to themselves and each other as they navigate the City streets. Part I addresses current laws and rules for bicyclists including liability issues; Part II will focus on what Pedestrians need to know; and Part III will focus on the rules of the road for motorists including their rights and responsibilities towards pedestrians and bicyclists. PART ONE OF A THREE PART SERIES - CIVIL CYCLING Background Since its establishment as the nation's capital in 1790, bicycles have been part of the street scene alongside buggies, streetcars and pedestrians. However, it was not until 1976 when commuting around DC by bike had more than doubled in response to the energy crisis of the 70s, that the District government adopted its first District Bicycle Plan to address infrastructure and safety issues. In 2003, the DC Department of Transportation (DDOT) found that between 1990 and 2000, bicycle commuting had increased by 55%, from a 0.75 percent share to a 1.16 percent share of all District-based work trips. Consequently, a Bicycle Master Plan was included as part of the District of Columbia Comprehensive Plan. The Bicycle Master Plan included recommendations for major infrastructure improvements to support bicycling in DC roadways public bicycle parking spots, increase bicycle safety through traffic calming measures, enforcement of regulations requiring private bicycle parking and improving bicycle access where barriers to bicycle travel exist. 2 In this article, we focus on major rights and responsibilities of bicyclists and liability issues when a collision occurs. Applicable laws and regulations can be found at D.C. Code and DCMR.Chapter: thru 1211, respectively. 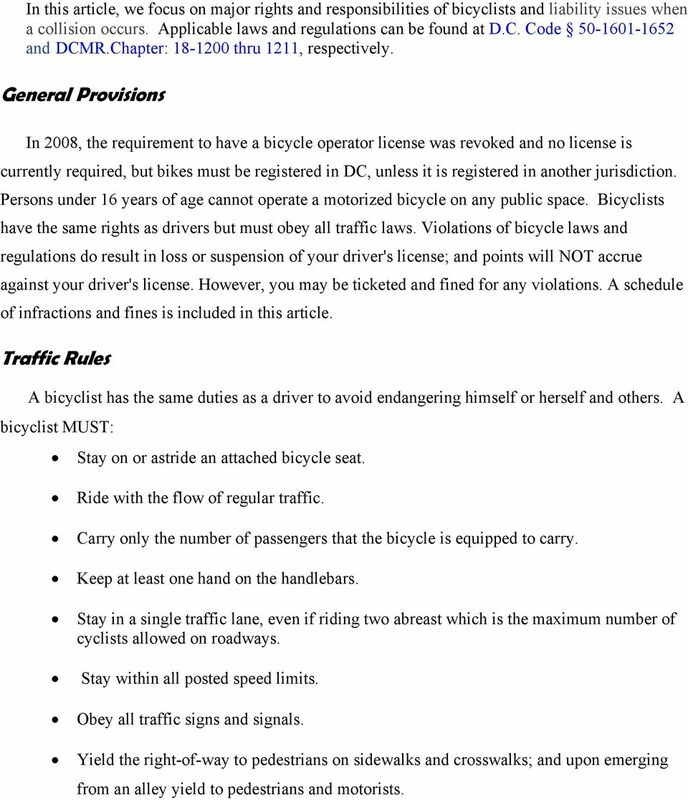 General Provisions In 2008, the requirement to have a bicycle operator license was revoked and no license is currently required, but bikes must be registered in DC, unless it is registered in another jurisdiction. Persons under 16 years of age cannot operate a motorized bicycle on any public space. Bicyclists have the same rights as drivers but must obey all traffic laws. Violations of bicycle laws and regulations do result in loss or suspension of your driver's license; and points will NOT accrue against your driver's license. However, you may be ticketed and fined for any violations. A schedule of infractions and fines is included in this article. Traffic Rules A bicyclist has the same duties as a driver to avoid endangering himself or herself and others. A bicyclist MUST: Stay on or astride an attached bicycle seat. Ride with the flow of regular traffic. Carry only the number of passengers that the bicycle is equipped to carry. Keep at least one hand on the handlebars. Stay in a single traffic lane, even if riding two abreast which is the maximum number of cyclists allowed on roadways. Stay within all posted speed limits. Obey all traffic signs and signals. Yield the right-of-way to pedestrians on sidewalks and crosswalks; and upon emerging from an alley yield to pedestrians and motorists. 4 cases involving bicycle accidents. As we noted above, bicyclists are required to obey the rules of the road, and both driver and rider have a basic duty to exercise ordinary care for their own safety and that of others on the road. The outcome of a lawsuit involving bicycle accidents requires the courts to make a determination on the basis of two factual questions - 1. Did the driver s negligence or recklessness cause the accident resulting in injuries, death or property damage? 2. Did the bicyclist in any way contribute to the accident? Violation of traffic rules may be deemed contributory negligence. If a cyclist is found to have contributed to the cause of the accident in any way, he or she will not be able to recover for damages or injuries. Recently, the District has sought to give bicyclists more protection and rights. These include: 1. The Access to Justice for Bicyclists Act of 2012 (D.C. Law , effective April 20, 2013 (DC Official Code Sec ), which provides for damages (the greater of $1000 or actual damages); and costs and reasonable attorney fees (up to $10,000) if a bicyclist is the victim of an accident and prevails in a civil action for an assault or battery by a motorist. 2. 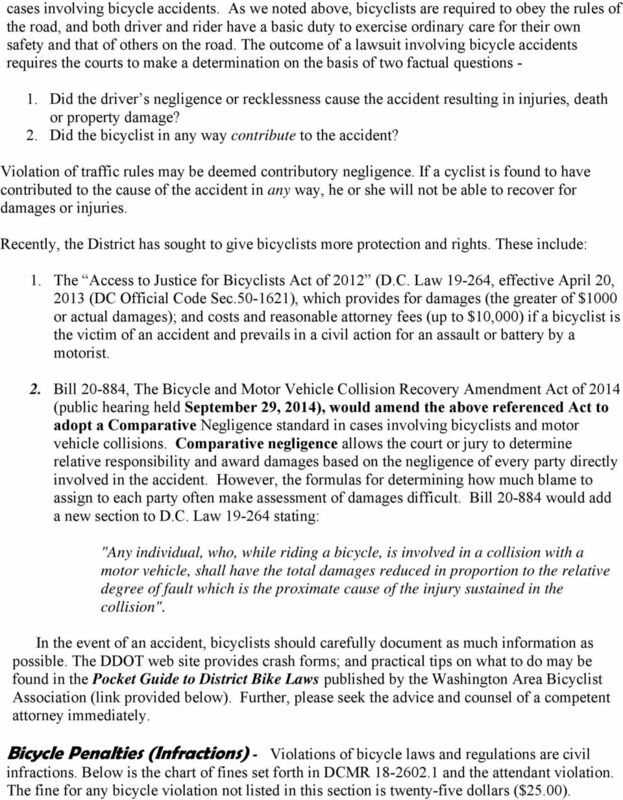 Bill , The Bicycle and Motor Vehicle Collision Recovery Amendment Act of 2014 (public hearing held September 29, 2014), would amend the above referenced Act to adopt a Comparative Negligence standard in cases involving bicyclists and motor vehicle collisions. Comparative negligence allows the court or jury to determine relative responsibility and award damages based on the negligence of every party directly involved in the accident. However, the formulas for determining how much blame to assign to each party often make assessment of damages difficult. Bill would add a new section to D.C. Law stating: "Any individual, who, while riding a bicycle, is involved in a collision with a motor vehicle, shall have the total damages reduced in proportion to the relative degree of fault which is the proximate cause of the injury sustained in the collision". In the event of an accident, bicyclists should carefully document as much information as possible. 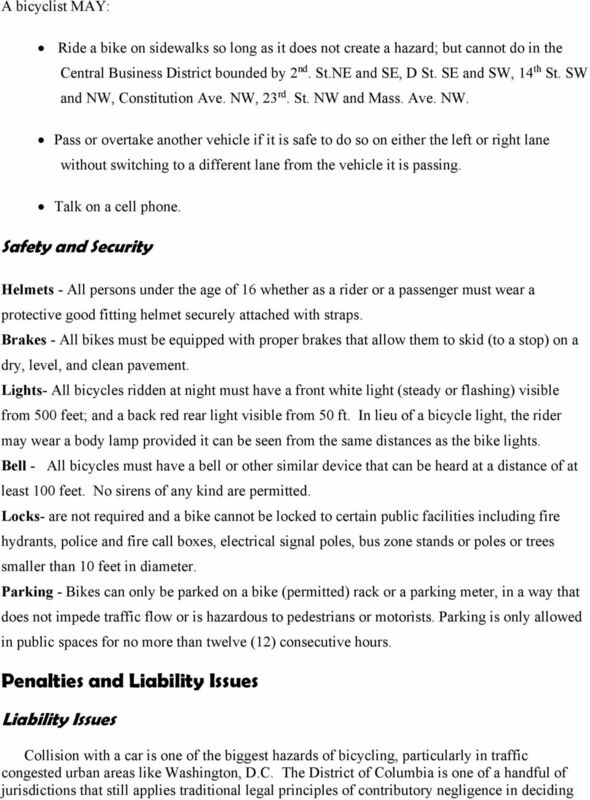 The DDOT web site provides crash forms; and practical tips on what to do may be found in the Pocket Guide to District Bike Laws published by the Washington Area Bicyclist Association (link provided below). Further, please seek the advice and counsel of a competent attorney immediately. Bicycle Penalties (Infractions) - Violations of bicycle laws and regulations are civil infractions. Below is the chart of fines set forth in DCMR and the attendant violation. 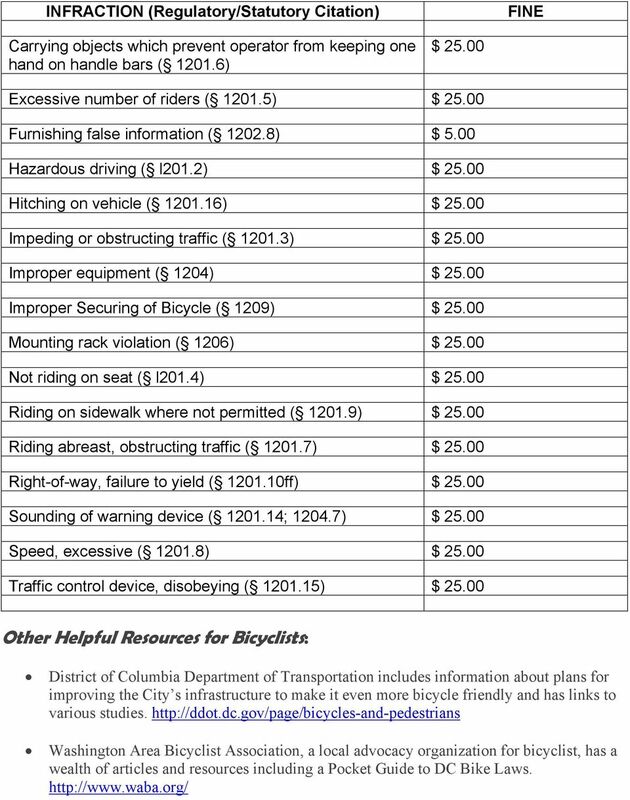 The fine for any bicycle violation not listed in this section is twenty-five dollars ($25.00). 5 INFRACTION (Regulatory/Statutory Citation) FINE Carrying objects which prevent operator from keeping one hand on handle bars ( ) $ Excessive number of riders ( ) $ Furnishing false information ( ) $ 5.00 Hazardous driving ( l201.2) $ Hitching on vehicle ( ) $ Impeding or obstructing traffic ( ) $ Improper equipment ( 1204) $ Improper Securing of Bicycle ( 1209) $ Mounting rack violation ( 1206) $ Not riding on seat ( l201.4) $ Riding on sidewalk where not permitted ( ) $ Riding abreast, obstructing traffic ( ) $ Right-of-way, failure to yield ( ff) $ Sounding of warning device ( ; ) $ Speed, excessive ( ) $ Traffic control device, disobeying ( ) $ Other Helpful Resources for Bicyclists: District of Columbia Department of Transportation includes information about plans for improving the City s infrastructure to make it even more bicycle friendly and has links to various studies. 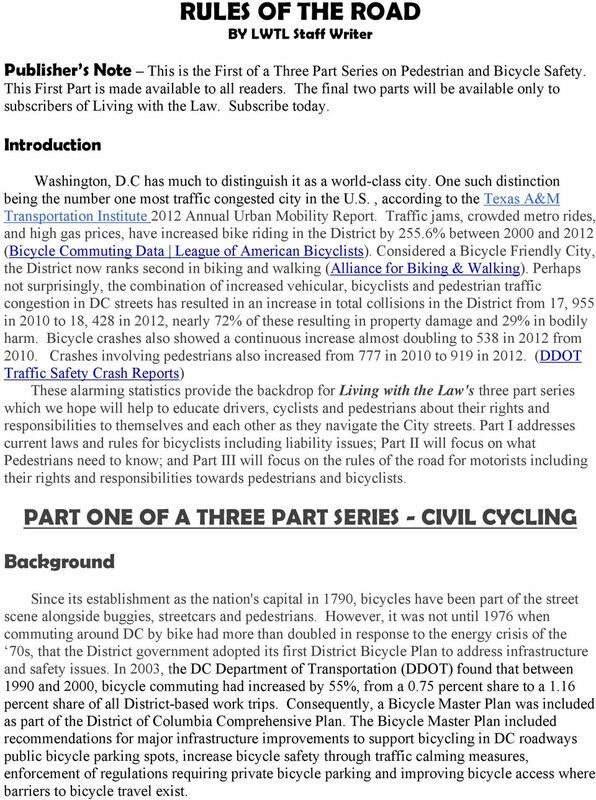 Washington Area Bicyclist Association, a local advocacy organization for bicyclist, has a wealth of articles and resources including a Pocket Guide to DC Bike Laws. 6 The Alliance for Biking and Walking is an advocacy organization to help federal, state and local governments build safe biking and walking communities. Bicycle Laws in North Carolina and the U.S. Violations: Sarasota City Codes and Florida State Statutes 1 over posted time limit 1 hr over posted time limit 2 hr over posted time limit City Code Sec. 33-118. in excess of posted time limits prohibited. VEHICLE & TRAFFIC LAW FINE PENALTY AND POINTS ASSESSED Please Note: Fines listed below are for informational use and only serve as a guide. Fines do not include any New York State mandated surcharges. APRIL 25, 2015 PREVENTING THEFT FROM VEHICLES The police department responds to numerous complaints of personal property being stolen from vehicles each year with a marked increase during the summer months.